When possible, a Preferred Jeweler will provide lifetime resizing of your ring. Some rings are not sizable, especially if there is a large size difference, a specialty design or there is micro pave. Changing the size of a ring with micro pave is never recommended. If you re-size this type of ring it will be unrepairable as the stones will loosen and the integrity of the ring will never be the same. Any scratches and or scuffs will be polished. Some finishes can't be restored especially specialty designer finishes. Steam, ultrasonic cleaning and polishing machines are used to bring your jewelry to pristine condition. *In the instances where Rhodium is required, a charge MAY be incurred. This is at the sole discretion of the Preferred Jeweler. Your earring backs will be repaired if they are no longer secure. 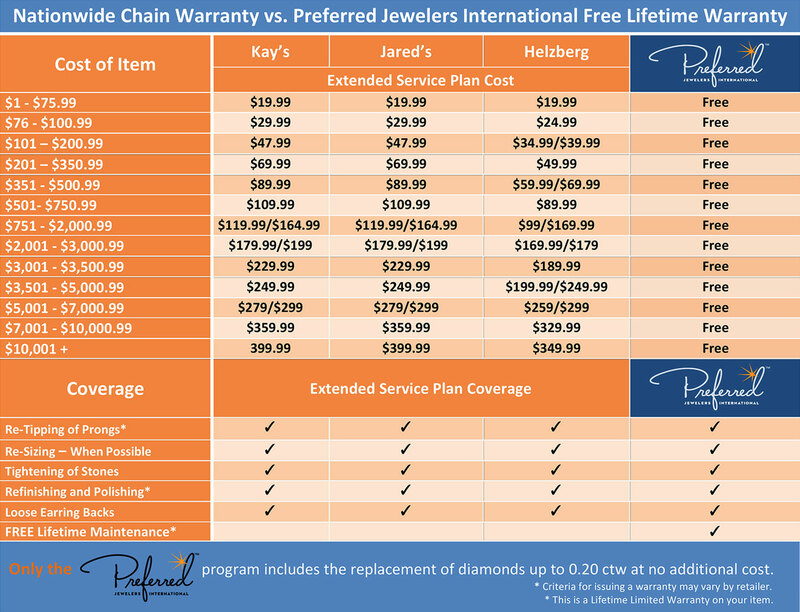 will replace a diamond up to .20ctw at no additional charge to consumer. *To keep your warranty valid you are required to visit your Preferred Jeweler every 6 months to have your items inspected and maintained. Your visit will be notated in the Preferred website database. Customer and retailer will be notified by email 30 days before and again 14 days before â€œdue dateï¿½? inspection. Please ensure that we have a valid email address on file. Should there be a lapse in time and warranty has become invalid the retailer may charge the customer to bring the item back into warrantable condition and then update and reinstate the warranty. Criteria for issuing a warranty may vary by retailer. Retailer has the option to apply for a RA Number and have the item sent in to the Preferred Facilitator â€œTrue Romanceï¿½? to implement service covered under the Preferred Nationwide Warranty.